According to a 2006 report compiled by the Food and Agriculture Organization of the United Nations, 10 countries in the world reported equine populations of more than a million with a total global equine count of 58 million. The United States, China, Mexico, Brazil, Argentina, Columbia, Mongolia, Ethiopia, Kazakhstan and the Russian Federation were the top 10. For most of its history, China has reigned supreme when it comes to horse population. The country relied heavily on its equine residents to assist with transportation and field work. In the 1970s, China boasted an equine count of 13 million, but the population dwindled in the last 30 years with the introduction of agricultural machinery and motorized vehicles. By 2004, the U.S. had surpassed the one-time equine giant, who then showed a population of about 7 million. 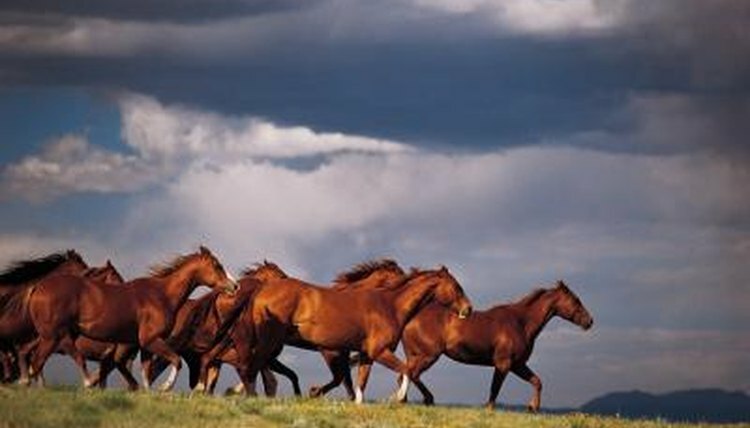 The United States reported the world's highest equine population by far -- 9.5 million, according to the 2006 study. In 2005, the American Horse Council conducted its own independent study, which came up with a population of 9,223,000 showing an elevation of 300,000 in just over a year. Among the states, Texas shows the highest horse population -- estimated at 978,822, with California at 698,345 and Florida at 500,124. Further information from the AHC indicates the horse industry has a direct impact of $39 billion on the U.S. economy, with an overall impact of $102 billion after factoring in indirect and induced spending. Additionally, the equine industry supports 1.4 million full-time equivalent jobs, and 4.6 million out of 300 million Americans are involved in the horse industry, either as horse owners, service providers, employees or volunteers, and tens of millions more contribute as spectators. Rounding out the top five in most populated countries are Mexico, Brazil and Argentina with 6,260,000, 5,787,249 and 3,655,000, respectively. The remaining top 10 include Columbia at 2,533,621, Mongolia at 2,029,100, Ethiopia at 1,655,383 the Russian Federation at 1,319,358 and Kazakhstan at 1,163,500.